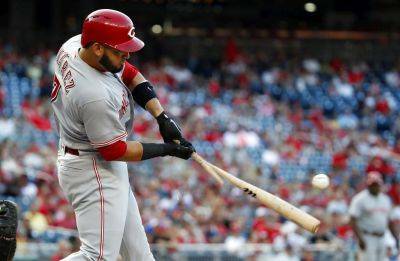 WASHINGTON — Nationals slugger Bryce Harper was forced to leave soon after being hit by a pitch, then Cincinnati Reds star Joey Votto went wild when he got drilled Saturday night as Washington won 6-2 to split a doubleheader. The Reds won a tame opener, 7-1. Things quickly turned testy in the nightcap. Harper was hit in the right kneecap in the sixth by a pitch from Austin Brice. Harper initially struggled to put any weight on his leg, but ultimately made his way to first base. But Harper labored defensively chasing after a double by Mason Williams in the seventh and was immediately replaced in right field by Adam Eaton — Harper said he’s not sure if he’ll be able to play Sunday. Votto also was hit in the first inning. Washington’s Spencer Kieboom was plunked in the seventh.